As a bow hunter, nothing is more fulfilling to me than placing an arrow right where it belongs and watching an animal die quickly. Its the most respectful thing we can do for the animal. Practice, make sure your gear is in check, take your time in the heat of the moment, and deliver an arrow right where it belongs so the animal passes quickly. Last week I eased out of work at 4:15(I live close to work). I slipped behind my house, stood by a large live oak, and at 5:15 I was dragging a nice doe out of the woods to have processed. She was quartered to me at 25 yards. 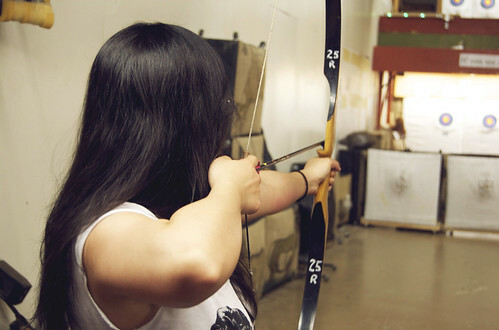 I delivered the arrow center of the shoulder facing me. Watched the lit nock go through her and to the ground. She was down in 20 yards or so. If you’re attempting to explain how to shoot a deer with a bow and arrow how would you verbally explain the broadside, quartering to, and quartering away shots to someone? Was inspecting my arrows and came across this one. Flex test didn’t make any sounds, but once I ran my fingernail on the shaft, I noticed this spot. I really didn’t take it seriously until I decided to break out my camera and have look. It really shows the crack better. These images have been cropped and resized, and zooming in isn’t as clear as the actual image. It’s not very big at all, but enough to put doubt into shooting it. To the trash it goes. Anyone have experience with this stand? Got one paints chipping a bit but it’s a few years old. seems pretty sturdy just bought new cables for it and straps anyone use this climber before? I am in the process of preparing for my first outfitted hunt in May. My father and I will be headed to TN to hunt hogs- we’ve never left Ohio to hunt. I’ve read as much as I can find online and watched as many youtube videos as I could and just want to make sure I’m thinking right for a hog killzone. This post was inspired by WapitiTalk1’s Shoot or No Shot 2018 posts over on the Western Bowhunting Gallery; although much less detailed- thanks for the inspiration WapitiTalk1! I am shooting a Hoyt Defiant 34 at 72# 28.5" DL with a 465 gr Gold Tip Pierce arrow with a magnus black hornet ser. Where can I go to see pictorials of where to place a killing arrow on brown and grizzly bears?